Towers of lush green canyon walls covered in drapes of ferns and freckled with wildflowers...you can hear the sound of a thundering waterfall, and feel the mist on your face as you approach. 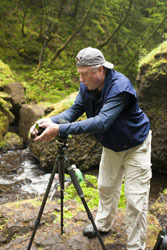 Welcome to the 2010 Columbia River Gorge workshop with the Aperture Academy! 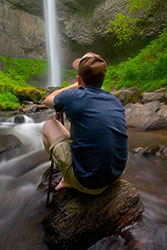 The Columbia River Gorge has one of the highest concentrations of waterfalls in the world. 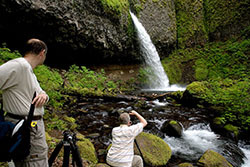 Literally hundreds of waterfalls dot the landscape, each with its own unique character and charm that make photographing this lush region of Oregon a trip for the ages. And May is the prime time to do it, when the runoff has begun, and all the waterfalls are brimming with activity. The wildflowers have begun their bloom, and the greens of the canyon walls are popping. 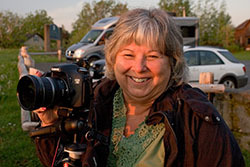 Ten eager photographers and two instructors, Stephen Oachs and Brian Rueb, met in Troutdale Oregon, on the outskirts of waterfall country, on Friday night. Everyone was eager to learn what their instructors had in store for them over the course of their weekend in the gorge. The group was from all over the map, and ran every level of experience and age; from those in their 20s to those in their 80s. 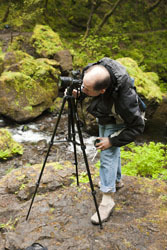 From seasoned veteran photographers, to those still getting used to their gear. This was a diverse and fun group, ready for any and all levels of adventure...and you know the Aperture Academy was up to the task! 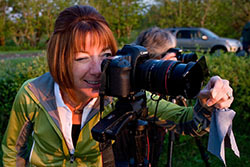 Our goals for each and every workshop are to offer our students every opportunity to learn in an environment conducive for great photography, and help them come away with some amazing images. But, most importantly, our goal is for everyone to have fun. 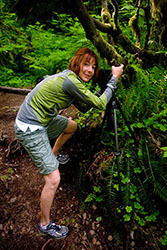 When we're conducting a multi-day workshop, we try to make sure we also provide challenges for those wanting to explore a bit rougher terrain, as well as take care of those in the group who are content with sticking closer to the highlights. 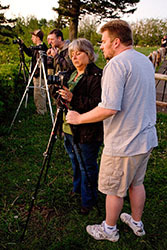 We began day one of our workshop bright and early at an overlook of the Columbia River Valley. The light was amazing, and our group quickly went to work finding compositions, and trying to capture that wonderful morning glow as it lit up the gorge. This was a great way also to get right into how helpful a good set of filters can be in making sure your images are the best they can be. Graduated ND filters and polarizing filters both helped to make the images captured from this spot more dynamic and balanced. While it was a great way for our group to start the day, we had a full day lined up, starting with the most iconic -- Multnomah Falls. 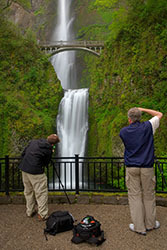 Multnomah Falls is a massive 650 ft. giant. We started the day working on some of the more customary shots of the falls, utilizing the bridge as a focal subject, to give the falls scale. 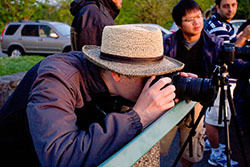 When the class had gotten the shots, we encouraged them to explore the bottom area looking for different compositions. 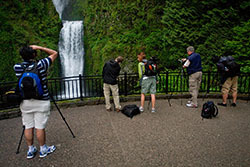 Waterfalls of this size are often difficult to photograph; the high flow and large scale are often difficult compositionally, so instructors worked with students on some methods that help control the exposure, and on using "less is more" for composing the falls in a shot. 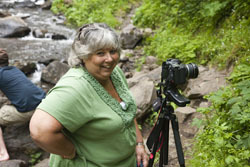 When the class had photographed the bottom of the falls, it was time to work our way up to the top. We spent some time on the bridge shooting the first tier of Multnomah, and it gave the students some nice practice in one of the biggest issues with Oregon waterfall photography...MIST. The mist generated from a waterfall this size can ruin a shot if you're not prepared. A shower cap and a lot of tissues from the local hotel were a perfect remedy to help combat the issue. Even though our group tried its best to keep Charmin in business, one of the best ways to make sure you leave a scene like this with a memorable image is to SHOOT, SHOOT, SHOOT. 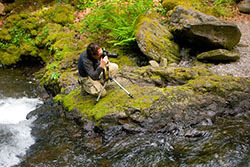 Take four or five shots of each composition to make sure you get one without water drops, or to give you more options later if blending is needed. 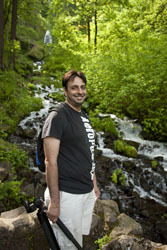 The hike from the bridge to the top of Multnomah Falls is long and all up hill. Some chose the hike, while others preferred to head back down and explore the creek and areas around the falls to conserve energy for later in the day. Every student is encouraged to follow their own comfort and interest level, and it works very well for everyone. From the top of the falls, a trail leads off into the lush green forest. Cascades meandering through moss covered boulder fields, and waterfalls ranging from 20 feet to 100 feet, this area is amazing to explore. 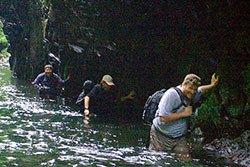 Instructors spread out to take the class to a variety of locations. 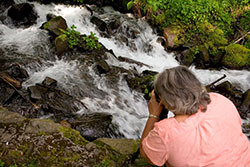 Many students were so enthralled with the cascades and creek scenes that they never made it up to the waterfalls. The area is a great example of the whole gorge. You can find something to photograph for as long as you're willing to walk, and every time you stop, there will be something beautiful to photograph. 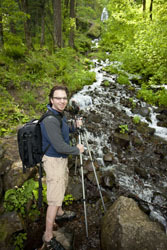 A portion of the class followed Brian Rueb up to and then down to Wisendanger Falls, a beautiful 100 ft. curtain falls that provided as much challenge to get to as it did to photograph. Time flies when you're having fun, and before we knew it, lunch was approaching and everyone was ready for a break. We provided the group with a nice lunch, and we sat at the seating area at the bottom of the falls, enjoying the beautiful weather, talking about the morning and planning for what the rest of the day would entail. 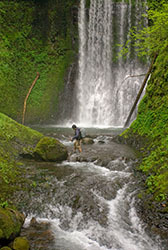 The gorge has a lot of waterfalls, and very few of them are easy to get to. 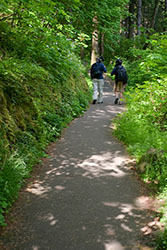 Most require a hike from 1/4 - 1.5 miles each direction. We tried to pick the best of the best to show the group...our goal was to offer the most bang for the buck with the least amount of hiking. 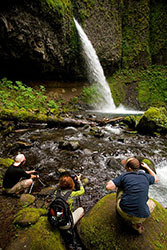 However, given the terrain and area, hiking is a big part of what we do in the gorge, and the four miles of hiking the group had completed in the morning session, combined with lunch, made many reluctant to get back to hiking right away. Because the sun had come out full force and put the falls in harsh light, we opted to give the group a small break to rest while we waited for the sun to move further across the sky and give us better light for the afternoon ahead. 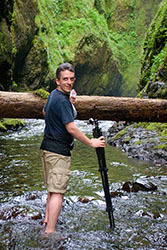 Next stop was Latourell Falls, which is fun to photograph. It is over 150 feet tall and requires minimal hiking to get to it. Within five minutes of leaving the car, the class was in and around the creek making compositions. This is a prime example of using "less is more" to create compositions. We pointed out interesting rocks and foreground areas, and then had the class use portions of the main falls to balance out the exposure. This class was great, most were either in the water or right at the edge, utilizing all the possibilities the creek provided compositionally. 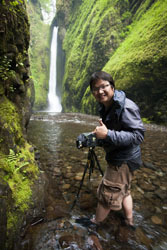 After the small hike to Latourell, it was time for a bit longer hike to Pony Tail Falls, a powerful gusher that shoots out of a basalt wall into a beautiful pool before cascading off down the mountain into Horsetail Falls and then off to the Columbia River. The group moved around Pony Tail with precision, finding all the great options vertically and horizontally the area had to offer. 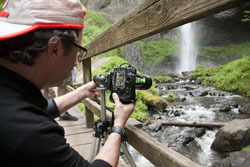 The instructors moved about, to help point out compositions for the class, and help make sure they had methods to balance the exposure so that the fast paced waterfall wasn't being blown out in their compositions as they tried to expose for the darker creek and foreground. While most people tend to lean towards using grad filters for more traditional landscape shots (like coastal or mountain images), they can be effective for waterfalls as well. 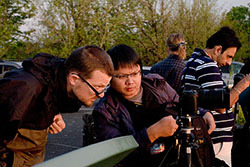 We used them in this location to make sure we got the images we wanted. This waterfall was nice in that it was big enough that the mist wasn't as big of a factor, so the class was able to spend more time shooting and less time wiping their lenses. The last spot of the day was a classic example of what makes the gorge so special. 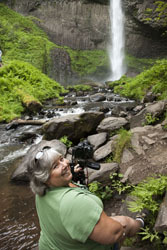 Oneonta Falls takes a little work to get to, but the payoff is what photography is all about. 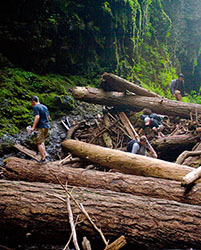 The hike in requires first crossing over "a few logs," and can be a bit intimidating. Wisely, those in the group who didn't feel comfortable with it headed back to photograph the creek, and wait for the rest of the group. This is one of the benefits of our workshops; each person gets exactly the experience that is best for them and their interests. 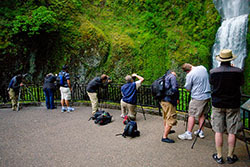 For those who continued on to Oneonta and navigated through the log field, they were treated to a view of a narrow 200 ft. high canyon glowing with the vibrant greens of moss and ferns. However, there was no time to sit and stare...the real treat was 200 yards farther in...a 120 ft. waterfall plunging over a carpet of mossy basalt as it falls into a cobalt blue pool. 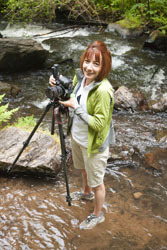 At Oneonta, in order to get to a vantage point where compositions are possible, it requires an icy hike through waist deep water...camera gear wrapped tight in protective bags, and in some cases held above your head. Under normal circumstances, nobody would subject themselves to water that cold for anything. But photography is different, it pushes you outside your comfort zone, and while the hike was cold and miserable, the minute the cameras came out, it didn't matter. Photography has a special way of making you forget the cold and focus on the images...which were some of the best of the trip. After wading back out through the cold water and hiking out, we looked forward to having some cold drinks and a good meal as a group. What better way to end a long day of great photography? The Edgefield complex in Troutdale was the perfect way to build our group camaraderie, wind down the first day, and wind up for the second day. The second day started out later than the first...we let our group rest, and get a good breakfast at the hotel before heading out. The group was definitely feeling the burn in their legs. The group was still excited to get out, and we weren't going to disappoint them. The second stop of the day was Wahclella, a thunderous waterfall located in a giant pool reached by an almost two mile hike. 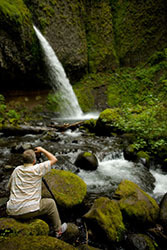 Many of the gorge's waterfalls are tricky to get to areas that offer really good compositions. Our goal with a group of this size is to make sure we point out as many options as possible for shooting, and work to get everyone in to the good spots so they can create memorable compositions. 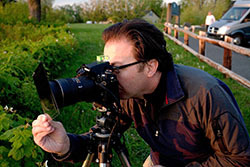 Photography always requires a degree of work, and we try to make it as fun as possible, and provide the pointers and information needed to make sure the work yields worthwhile results. 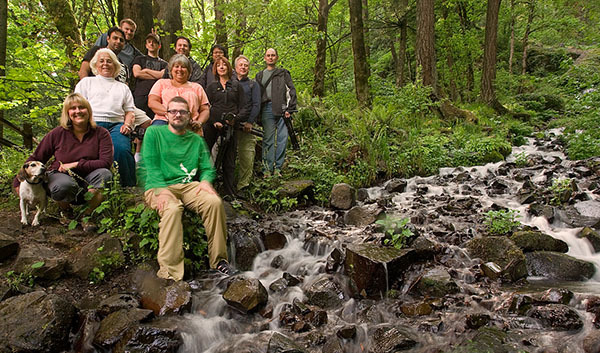 When Wahclella was too blasted by sunlight (weird for Oregon) to continue photographing, we pushed to Cascade Locks for a group lunch and a chance to rest before hitting our last amazing location of the worksop. We saved our favorite location for last. Elowah Falls is a beautiful 120 foot stream, falling over a huge cliff covered in vibrant mosses of varying shades of green. A lovely little bridge crosses the stream, providing access to the other side as well as an object to use in our images to give interest and scale. We like this spot for a number of reasons. Its sheer size is impressive, and just mesmerizing. It also offers the most space for composing. Our group was giddy to wander off searching for just the right one. The hike in has a lot of uphill in it, and when you put forth effort to get to a location, it makes it that much more special to photograph. Seeing the tired faces on the trail turn to smiles when they saw what they were going to spend the next hour photographing was awesome, and the smiles continued for the rest of the time there. The shots we saw in the cameras were amazing...each different than the next...even when the students were just feet apart from one another. The class didn't want to leave. After two days of learning, photographing, and fun, it becomes a part of you, and the thought of not photographing becomes alien. This class was great. They all were game to try anything, and the instructors were pleased with how well everyone handled the strains of hiking, and at the vast numbers of quality images they saw. Admittedly, it took some work, but all agreed, it was well worth it.